Do you want to block incoming calls and SMS on your iPhone 6 and above without using iPhone call blocker? Then, you probably need to read this article on how to block calls on iPhone devices. This tutorial will dig into how to block text, flash, codes, and incoming calls on all type of iPhone devices including iPhone 6, iPhone 7, iPhone 8, and iPhone X. Ever got a nuisance number calling you on your iPhone and texting you without your permission and will love to block the number, you can block the number with the help of iPhone call blocker app or block the number using iPhone call block feature. For Android phone users, it’s very easy to block annoying calls with or without call blocker app. Meanwhile, when you block someone on any iPhone, say iPhone 4, the caller will not hear anything. The only thing they hear is call drop and your phone system will automate call block from the incoming number and all text will be blocked as well from the number. But, if the person calling called with another phone number that is not on your phone blacklist, the number will go through and if you pick the call, the person will either know you have blocked his number or assuming there is a network problem. This is to specifically block incoming calls and text messages on iPhone 6 and iPhone 6s version. Although there are two different ways to block calls on iPhone 6, you can use the “Do not disturb” feature on your iPhone 6 and iPhone 6s to block incoming calls and also use call block feature to block individual number. The “Do not disturb” will redirect all incoming to voice mail and mute all SMS notifications coming to your phone. The list of numbers added to the blocked list will be blacklisted. Hence, both incoming calls and SMS will be blocked by your number. You can schedule incoming calls and text notification from all incoming numbers include numbers saved on your phone contact list. Note: You can also schedule call block at a specific time to a specific time. During this time all calls will be blocked after which your iPhone 6 or iPhone 6s will automatically disable the manual call blocking feature. 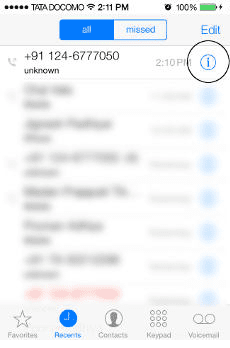 Also, with the manual call block feature, use the “Allow calls from” to allow calls from specific numbers such as your spouse number, siblings number etc. The same procedure would have been used to block incoming calls and SMS on iPhone 6 and iPhone 7 iOS but, there is a difference in the two devices. However, this little difference brings about writing different approach for the two phones. 4. Select a number to be blacklisted from your phone contact and add it. However, this approach to block incoming calls on iPhone 6 and iPhone 7 only works for saved contacts. But, what if you want to block calls from unknown numbers? The above approach can only be used to block incoming calls from your phone contact. But, in case you want to block numbers that are not saved on your device here is how to go about it. 3. Click “Block caller” from the pop-up. This procedure makes it very easy to block incoming calls and text messages on iPhone 7 and iPhone 7 plus. The procedure can be used to block both saved and unsaved phone contact. 4. Click on “Add New” to add the number to be blocked directly from your phone contact. The process to block calls on iPhone 8 works on iPhone X. Therefore, if you run an iOS X device, you can follow the procedure to block calls on iPhone 8 above to achieve the same result.